Miniature Dress Me dolls, Souvenir dolls, Tourist dolls, 6-18" tall, early dolls were made of composition, after 1946 dolls could be made of hard plastic. Dress me dolls general characteristics are; boy dolls or girls dolls had painted eyes or sleep eyes usually in blue, mohair wig for girls, painted hair for boys jointed at neck and shoulders, un-jointed hips with straight legs, some with high heel feet, flat feet, molded painted on shoes, some with painted socks, too. Most dolls are unmarked, came in a box that may or may not have the company name to identify who made the doll. Early dolls were sold as dressed dolls, boys usually dressed as a groom or cowboy, girl dolls in a wide variety of costumes, even as Nun dolls. Later dolls were sold undressed in plastic baggies to be dressed by the new owner. Advertisers used Dress Me dolls as premiums, they were used as Souvenir or tourist dolls; dressed in local costumes of the region where they were sold. Dolls may also have been used by churches, charities, girl scouts to dress and sell. 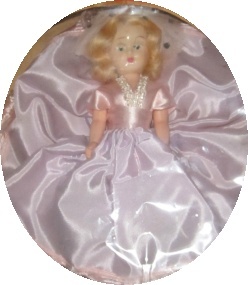 The dress-me dolls were made by the thousands, maybe even millions, by many different doll makers. These dolls are made of composition. These dolls are made of sturdy plastic. Elite Creations Company, 8" tall composition Dress Me boy doll, one piece head, body and straight legs, jointed only at the shoulders, painted facial features, painted on black boots, probably came dressed as a groom or cowboy doll, doll marked ELITE with a hole and staple on his back. Grant Plastics, 11" tall hard plastic Dress Me girl doll. Some companies that made vintage Dress Me dolls; A & H Around the World dolls and Marcie dolls, A Rosalie Doll, Active Beau Arts dressed 5 1/2" dolls, Admiration; Dolls of All Countries or Dolls of all Nations, Allison Corporation; Dress Me dolls, Atlantic Richfield Company (ARCO); Dolls of the World, Blue Bonnet Sue Storybook dolls (sold as mail in premiums), Carlson Eskimo, Indian, soldiers, plus other uniforms dressed dolls, Commonwealth, Confetti Doll Company, Doll Bodies, Inc., Doll Craftin', Duchess dolls, Elite Creations Doll Company, ENSCO dolls, Eugenia Doll Company, Fairyland Doll Company slogan; Famous Figures of Fact and Fancy . . . Costumed, Grant Plastics, Hollywood Dolls, House of Dolls, Chicago, IL; Melody dolls, Kraft cheese dolls, LeeWards Dexter craft dolls, Made in Hong Kong, Midwestern Manufacturing Company dolls, Nancy Ann Storybook Doll Company, Norma Originals; "The Doll with an Educational Story", PMA Plastic Molded Arts Company, Princess Ann Doll Company, Reddi-Wip dolls, Reliable Toy Company, Royal (called Tiny Teen dolls), Sears, Souvenir dolls, Spiegel, Standard Doll Company, Virga dolls, Wards, Woolco / Woolworths and others.